astronomy is the occupation with what one can see and observe in the sky and thus, above the earth and the horizon. traditionally, this includes first and foremost the sun, the moon, the stars, and the planets. the attention is mainly attracted by two different types of motion for these heavenly bodies. their daily motion around the earth and their motion in relation to each other. the daily motion results from the earth’s rotation around its axis and the motion in relation to each other from the movement of the observed bodies. earth’s rotation is very regular, while the motion of the other bodies may be irregular, depending on their orbits around a central body – the moon revolving around the earth; the earth and the other planets revolving around the sun. though it is possible to calculate a mean orbital period through long-term observation of the bodies’ motion, their actual orbital motion will always, at times, be a bit faster or slower than that theoretical average motion. the mean time that passes from one full moon to the next is 29.530589 days. since on its orbit around earth, the moon is accelerated by the sun while moving towards it, and is slowed by the sun while moving away from it, and since on top of this, due to its orbit being an ellipsis, it sometimes moves faster and sometimes slower on its path, the deviation to the average value can amount to +/- 20h. and due to the interferences of the other planets, the deviation can increase considerably in the case of the moon. even the derivation of the mean orbital period of 29.530589 days based on the standard rotations of a watch – e.g. the rotation of the minute hand in one hour or that of the hour hand in 12 or 24 hours – requires considerable mathematical and constructional efforts in order to arrive at a fitting gear. these efforts are worthwhile, however. a further step in the sophistication of the motion, even taking only the first two irregularities, i.e. the elliptical orbit and the gravitational pull of the sun, into account requires additional constructional and mechanical efforts, which can only be reasonably carried out in large clocks. the türler clock as well as other large clocks by bürgi, or the clock of the strassbourg minster, have been equipped with such mechanisms. in smaller watches, such as pocket and wrist watches, it is already a matter of pride to have found a good gear for the mean motion. accordingly, the owner of such a watch cannot expect astronomical precision – except of the mean orbital period – from a moon phase display; after all, he has to reckon with a deviation of up to +/- 20 hours from the calendrical date of the full or new moon. this may lead to a situation where the astronomical full moon can be observed on one day at 2300, while the watch only shows said full moon precisely on the following day. to expect more precision than that shows a lack of understanding of these facts. 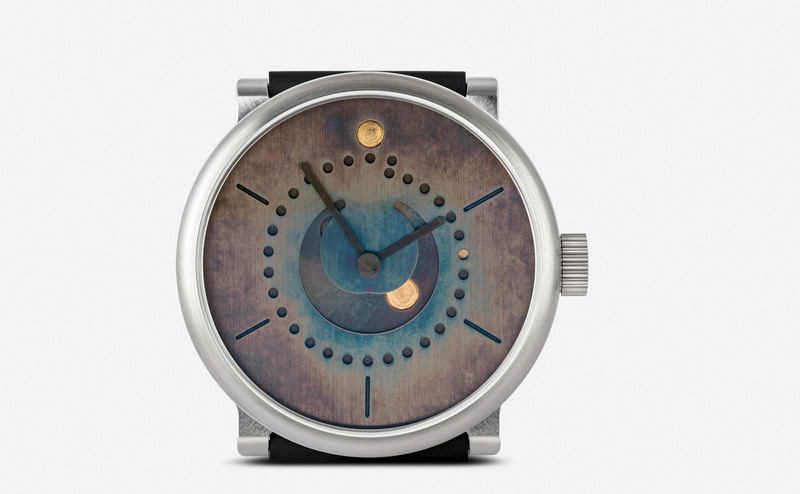 Pictured: moon phase – Wild patina.